I have seen many organized closets in magazines, on line, and at IKEA. I have drooled over and dreamed about some of them. We have a good sized closet now and it's not full so I don't feel the need to buy all the extra stuff, yet. I'm sure once I get everything else done it will be put on my project list. I do have a way that I organize my clothes though. A few months ago, maybe for Memorial day, Meg was in need of a red shirt. She didn't have one. She asked Mickey if I had one she could borrow. Mickey replied that I didn't have a red shirt. Meg didn't believe him. He opened the closet door and said look for yourself. She looked and couldn't believe how I had my clothes hung. Is this so weird? 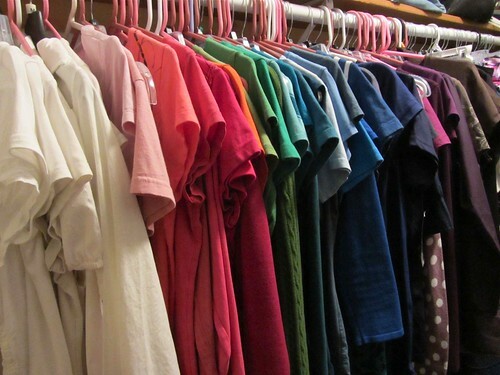 I hang my shirts by color and in rainbow order. That way I know where a certain shirt is and I know where to hang it back up when it's clean. One less thing to stress over. On the other hand, Mickey's side of the closet.....I'll let you guess how he organizes his. I'm going to take a little hiatus. My fingers and brain need a break. Be back soon.